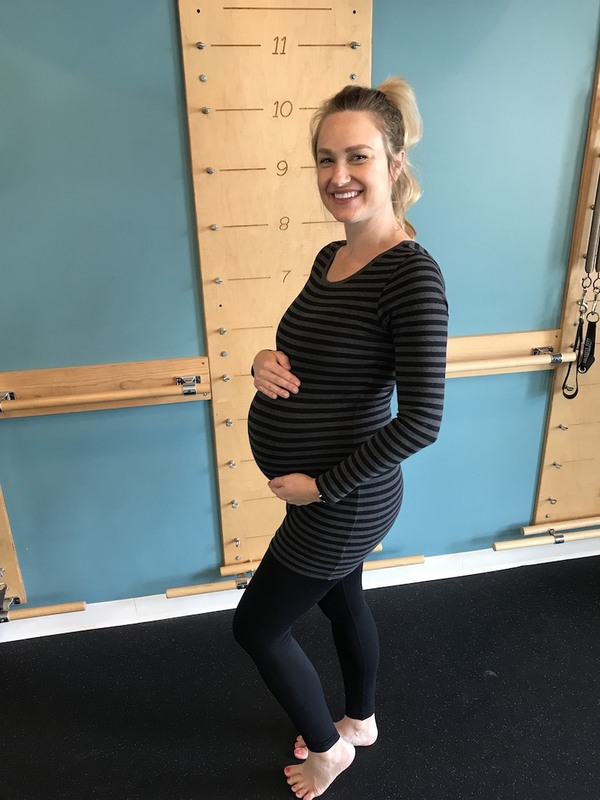 An honest, unfiltered blog about a Pilates instructor’s journey to stay fit and healthy during her first pregnancy. So this month has been FAR more relaxing and laid back compared to last month and I’m feeling extraordinarily calm – which is not like me at all! Maybe it’s the calm before the storm?? I’ve been enjoying putting the finishing touches on the nursery and am trying not to get too crazy about every single thing being perfect in the house. Our renovation is FINALLY done – yay for a functioning kitchen! – but is far from furnished or decorated. Oh well, that will come in time and our baby girl won’t care anyway! Our doctor appointments have become much more frequent in Month 8. Starting at 36 weeks, I now have weekly checkups. I did receive a bit of a scare at my 36-week appointment when the doctor measured my fundal height (the length from your pubic bone to the top of your uterus) and I was only measuring 33 weeks. So they sent me in for an ultrasound straight away to make sure she was growing okay and there was nothing wrong with my amniotic fluid or placenta. Turns out everything was perfectly fine and I was measuring small because she’s already dropped pretty low into my pelvis – so that explains the (even more) frequent trips to the bathroom over the last couple of weeks. Her position in my pelvis is no indication that she’s coming anytime soon though. First babies tend to get into position several weeks before game day…unlike subsequent babies. At this point, I’m not feeling the huge desire to nest (I think I got that out of the way a few weeks ago) and am just trying to patiently await her arrival! Now that I have a bit more time, I’ve started walking again. Although I only get 2 or 3 walks in per week and they max out around 2 miles these days. I’m also doing quite a bit of at home Pilates stretches and exercises to prepare and keep my body in shape for the big day. And I’m still jumping on the Pilates equipment at the studio to get a good stretch in or demonstrate an exercise here or there for my clients. I have more week of teaching – I’ll be 39 weeks and 1 day on my last day unless she decides to come early. Well now that we have a functioning kitchen, eating healthy just got a lot easier and more convenient! I’m not saying I have the best hubby in the world – but he does do all of the cooking each night and on the weekends. The meal plan is pretty much the same as month 7, but I am finding that my appetite is getting smaller and smaller – there’s just not a lot of room for it all to go! Although, it hasn’t seemed to slow my weight gain any this month. I’m up just about 35 pounds – which is a very healthy gain and I’m not really stressing it too much! Okay…so I’m finally starting to feel pregnant and getting up and down and around is becoming harder, but I gotta say – I feel good! Maybe that’s because I know the end is in sight, but beyond a few minor aches and pains I feel good. Not saying that I can’t wait to get my pre-pregnancy energy and stamina back, but it’s really not that bad! Same things as the previous months. Some achy hips and a cranky low back every now and again and heartburn is basically an everyday thing! I’ve also started to get a little itchier (with the skin becoming so stretched at this point) – which has made sleep pretty elusive a few nights.